The court denied defendant's motion to vacate the court's award of enhanced damages issued the same day as Halo. "[Defendant] identifies no procedural basis for its Motion . . . which would inform the Court’s standard of review. Regardless . . . the Court takes this opportunity to examine the relevant law, including the Supreme Court’s recent decision in [Halo Elecs., Inc. v. Pulse Elecs., Inc., 136 S. Ct. 1923 (2016)] . . . to ensure that the Court’s decision in which it trebled damages comports with the Supreme Court’s new guidance. . . . [T]reble damages were awarded after comprehensive – perhaps, painstakingly so – consideration of the particular circumstances of this case. . . . Trial in this case has established by clear and convincing evidence – a higher standard than is now applicable to a willfulness inquiry under Halo – that [defendant] willfully infringed [plaintiff's] patented off-throttle steering technology in contravention of the United States Patent Act. It did so with full knowledge of [plaintiff's] patent rights, without so much as approaching [plaintiff] about a license, as is demonstrated by, inter alia, its hiring of an agent to surreptitiously buy [plaintiff's] patents without disclosing [defendant] as the intended buyer. . . . Suffice it to say, [defendant] is the wanton infringer that the Supreme Court sought to punish through its relaxation of the standard governing willfulness and enhancement of damages." The Board partly granted institution of inter partes review of a patent directed to an improved airport security system under 35 U.S.C. § 103(a), and rejected the patent owner's argument that the petition should be denied under 35 U.S.C. § 315(b). "[Defendant in the earlier lawsuit] moved for dismissal . . . arguing . . . that Patent Owner’s 'exclusive remedy is an action against the United States under 28 U.S.C. § 1498(a).' . . . The district court granted [defendant's] motion . . . . [T]he United States’] mere participation in [that] litigation and assumption of liability do not, without more, make a party a real party in interest. . . . [W]hile Patent Owner’s argument that the United States 'directed and controlled the allegedly infringing activity' is not without relevance, it does not bear directly on the categories identified by the Supreme Court in [Taylor v. Sturgell, 553 U.S. 880 (2008)], and which the Board has applied in considering whether third parties are real parties in interest. . . . Essentially, Patent Owner sued the wrong defendant in the [patent infringement] litigation. When it sued the correct defendant in the Court of Federal Claims litigation, the defendant responded by filing a petition for inter partes review within the one-year window provided by § 315(b). . . . [W]e are not persuaded that the statutory bar applies against the correct defendant under such a scenario, even considering the specific facts of Petitioner’s involvement with the [patent infringement] litigation as set forth on the record before us." The court granted defendants' motion to dismiss because the asserted claims of plaintiff’s network information management patent encompassed unpatentable subject matter and found that the claims were directed toward an abstract idea. "Plaintiff responds that the [patent-in-suit] . . . is directed to specific improvements in the functioning of computers. . . . [T]he claims . . . are directed to the abstract idea of using information stored in one place to determine the location of and retrieve information stored in a second place, i.e., a form of 'information management.'. . . [T]he Court agrees with Defendants that the concept of using a 'pointer' found in one place to locate and retrieve information found in a separate place is indistinguishable from the idea of using an information desk, a catalogue, or the Dewey Decimal System to locate a desired library book, either within the same library or in a separate library using, say, an interlibrary loan. . . . [T]he claims . . . do not purport to alter the structure or function of the physical object, the computer, or indeed any part of the network of computers." The court denied plaintiff's motion for enhanced damages under 35 U.S.C. § 284 and rejected plaintiff's argument that the jury finding of willful infringement was binding on the court. "[Plaintiff] argues that the jury’s willfulness finding is binding on the Court, that enhanced damages are required, and that the Court’s discretion lies only in deciding what amount of enhanced damages to award. . . . While the [Read Corp. v. Portec, Inc., 970 F.2d 816, 827 (Fed. Cir. 1992)] factors remain helpful to this Court’s analysis, the touchstone for awarding enhanced damages after [Halo Electronics, Inc. v. Pulse Electronics, Inc., 136 S. Ct. 1923 (2016)] is egregiousness. . . . 'The subjective willfulness of a patent infringer, intentional or knowing, may warrant enhanced damages . . . .' Assuming without deciding that the jury’s verdict, based on the subjective prong of the now-overruled [In re Seagate Tech., LLC, 497 F.3d 1360 (Fed. Cir. 2007)] test, is sufficient to find subjective willfulness, the Court still finds, in its discretion, that the defendants’ conduct did not rise to the level of egregiousness meriting an award of enhanced damages. . . . [D]efendants did not deliberately copy the [patent-in-suit], did not try to conceal the chips found to be infringing, did reasonably investigate the scope of the patent, and did form a good faith belief that their products did not infringe based on their view of the proper claim construction and crystallinity of their buffer layer." The court denied defendant's motion for judgment on the pleadings on the ground that plaintiff’s semiconductor memory circuit board configuration patents encompassed unpatentable subject matter because the claims were not directed toward an abstract idea. "According to [defendant], '[p]ut simply, space optimization — the sole purported improvement claimed in the [patents-in-suit] — is a fundamental concept and is not patentable as a matter of law.' The Court, however, believes that [defendant] frames the issue too generally — the patents at issue here concern physical layouts for particular memory cards that enable the card to either have a slimmer profile or have more memory chips on it than it otherwise would have had. . . . This is not a case where an inventor is trying to get around the prohibition of patenting abstract processes by tying an abstract process such as multitasking, a computer hardware design process, or a bingo game to a generic computer setup that executes that abstract idea. Rather, the hardware configuration itself is the unique focus of the patent. . . . [Defendant] has not . . . cited any case where a court found that a claim for a purportedly novel physical configuration of a piece of computer hardware was deemed patent-ineligible because it was merely the embodiment of an abstract process." The court granted plaintiff's motion to exclude the testimony of defendant's patent expert regarding possible patent examiner responses as unqualified. 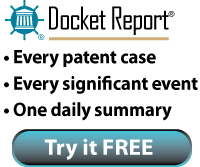 "[Defendant's expert] provides opinions about two possible patent examiner responses. First, he opines about what an examiner 'could' have done if informed of [a prior art] Abstract. Second, he opines that 'under PTO procedure, by a preponderance of the evidence, the surgeries would have been considered not experimental.'. . . Both opinions raise the issue of whether an expert can testify as to the thought processes of an examiner who was provided with different information. [The expert's] resumé fails to establish his education, training, or experience in the field of retroactive mind reading of the thoughts of patent examiners. . . . [He] also lacks the experience to opine about the technology-at-issue. His CV indicates education and experience in computer and electrical engineering, but not surgery or medical devices, which are the subjects of the patents-at-issue." The court granted defendant's motion to dismiss because the asserted claims of plaintiff’s patents for processing information via networked computers encompassed unpatentable subject matter and found that the claims were directed toward an abstract idea. "Plaintiff contends that the claims here are not directed to abstract ideas, but instead to a new computer (or, more specifically, a more efficiently and reliably distributed configuration of multiple computers), resulting in better performance. . . . [I]t is clear that the networked computers utilized in the [patents-in-suit] are merely generic computers tasked with performing generic functions. . . . Nor are the claimed systems or methods limited to a particular type of process or task. . . . [T]he claims are not directed to solving a technological problem or solve a challenge particular to a specific environment, nor do they contemplate some 'new' type of computer. . . . Plaintiff also contends that the claims here are not directed to abstract ideas because they cannot be performed by humans. But the fact that inventions here are implemented on computers or only exist in the computing realm does not save them." Following judgment on the pleadings of unpatentable subject matter, the court denied defendants' motion for attorney fees under 35 U.S.C. § 285, because plaintiff's litigation positions were not baseless. "According to [defendants], after [Alice Corporation Pty. Ltd. v. CLS Bank International, 134 S. Ct. 2347 (2014)] Plaintiff should have known that its litigation position was weak and that continued litigation was unreasonable because Plaintiff’s patent, like the patents in Alice, relied on generic computer implementation to make its ineligible concepts patent eligible. . . . In response to [defendants'] motion for judgment on the pleadings, Plaintiff explained why its patent was not directed to an abstract idea, as well as why its patent, even if it were directed to an abstract idea, nonetheless contained an inventive concept. Although Plaintiff’s arguments were ultimately rejected, the Court does not agree that this is sufficient grounds for finding this case 'exceptional.'. . . The Court also declines to find, as [defendant] appears to advocate, that patent holders whose patents may be similar to the patent in Alice should have to decide between voluntarily dismissing their suits or being assessed attorneys’ fees pursuant to section 285." The magistrate judge recommended denying defendant's motion to dismiss plaintiff's willful infringement claim for failure to state a claim and found that the Supreme Court's recent decision in Halo Elecs., Inc. v. Pulse Elecs., Inc., 136 S. Ct. 1923 (2016), did not require plaintiff to first seek a preliminary injunction. "While true that the '[In re Seagate Tech., LLC, 497 F.3d 1360 (Fed. Cir. 2007),] test' is distinct from Seagate's preliminary injunction requirement, the court finds in Halo a wholesale supplanting of the Federal Circuit's 'inelastic constraints' in favor of an approach that affords district courts the discretion to mete out damages as they see fit; with or without a plaintiff moving for a preliminary injunction. Indeed, if in the midst of its derogation of Seagate, the Court had intended for a significant aspect of that case to remain intact, it likely would have said so. Halo thus broadly rejects any formal restriction on a district court's discretion to award enhanced damages." The court granted defendant's motion in limine to exclude the testimony of plaintiff's damages expert regarding reasonable royalty damages as unreliable for a lack of apportionment. "[The expert's] opinions on a reasonable royalty rate must be excluded because he did not engage in any apportionment or attempt to separate the value of the patented features from the unpatented features. . . . [The expert's] basis for concluding that the patented features drive demand is insufficient. He relies on the fact that [plaintiff] chooses to highlight the patented features in its marketing to conclude that the patented features drive consumer demand. However, the fact that a company chooses to advertise its products in a certain way says nothing about why a customer chooses to purchase a particular product. . . . [T]he accused air handling systems are made up of several components, including components that are not accused of infringement. . . . [Plaintiff] has not supported its use of the entire market value rule in this case. . . ."
The court granted defendant's motion to dismiss because the asserted claims of plaintiff’s patents for automatically generating molded part quotations encompassed unpatentable subject matter and found that the claims lacked an inventive concept. "[T]he fact that the [patent-in-suit] manages and implements the quotation process via a computer or 'automatically,' standing alone, does not render the asserted claims patent-eligible. . . . [T]he 'invention' claimed by the [patent] is nothing more than 'a computerized method for fast identification of the mold manufacturability issues' wherein 'mold manufacturability issues are automatically identified and communicated to the customer.' However, 'relying on a computer to perform routine tasks more quickly or more accurately is insufficient to render a claim patent eligible.'. . . [T]he fact that the human mind is unable to interpret the raw bits of information contained in a CAD file is not determinative of whether the asserted claims are directed to an abstract concept. . . . [T]he use of CAD files and CAD software to convey and interpret a customer’s part design as part of the quotation process is not an inventive concept in the mold-making industry." The special master recommended granting defendants' motions to dismiss because the asserted claims of plaintiff’s patent for remotely accessing and controlling an application over a network encompassed unpatentable subject matter and found that the claims lacked an inventive concept. "The invention relates to remote execution of computer programs over a network . . . without requiring pre-installation of the remote control program on the user’s computer. . . . The claim recites a first computer and a second computer. Such generic computers are insufficient to transform the claim into patent eligible subject matter. The claim further recites that the . . . 'remote control module' is transmitted from one computer system to another. Transmitting digitally coded information, of any type, over a network from one computer system to another could hardly be considered anything other than routine at the time of the invention. . . . Plaintiff characterizes the Internet in 1995 as being in its 'infancy', and argues that at the time of the invention these limitations were not 'conventional.' Infancy or not, the specification makes clear that the Internet and related network technology, including the use of modules capable of being interpreted by a browser and that did not require installation, were all well-known within the industry. . . . [W]hether or not the technology was fairly characterized as 'new,' it was sufficiently known to qualify as 'conventional' under the second step of [Alice Corp. Pty. Ltd. v. CLS Bank Int’l, 134 S. Ct. 2347 (2014)]." In the U.S. District Court for the Northern District of California (N.D. Cal. ), an opportunity for law firm associates without many years of experience has opened up in a case being argued before Judge William Alsup. Judge Alsup has encouraged the use of lawyers recently out of law school in his courtroom, whether in oral argument or during witness examination. On July 1st, Judge Alsup issued a notice regarding opportunities for young attorneys in a case which he is trying. The case is Illumina, Inc. et. al. v. Qiagen, N.V. et. al., case number 16-CV-2788. The case revolves around a patent held by Illumina in the field of DNA sequencing, U.S. Patent No. 7566537, entitled Labelled Nucleotides. At issue is Qiagen’s marketing of a DNA sequencing product known as GeneReader which Qiagen has attempted to market in areas under the jurisdiction of N.D. Cal., including San Francisco and Pleasanton. Judge Alsup is specifically seeking young attorneys with four or fewer years of experience out of law school to argue two motions filed by the defense. One is a motion to transfer the case to the District of Delaware (D. Del. ), where Qiagen argues that the parties have already been litigating the validity of the ‘537 patent. The other is a motion to dismiss the case because of a lack of personal jurisdiction. Both motions were filed around the middle of June. The insight afforded by the legal case analytics services offered by Docket Navigator can keep a firm informed on a judge’s past decisions in the face of various motions. In this particular case, it could help the young attorneys involved with the Illumina v. Qiagen case make an educated decision on the likelihood that Judge Alsup would decide in favor of either of these motions. 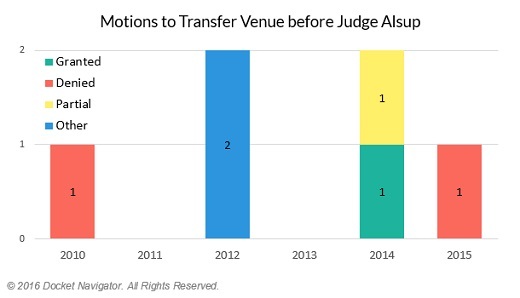 On the motion to transfer to a new venue, Docket Navigator analytics show that, historically, Judge Alsup has split down the middle in terms of granting or denying such a motion. One 2010 motion to transfer was denied because Judge Alsup was not convinced that the transfer would be convenient to both parties. 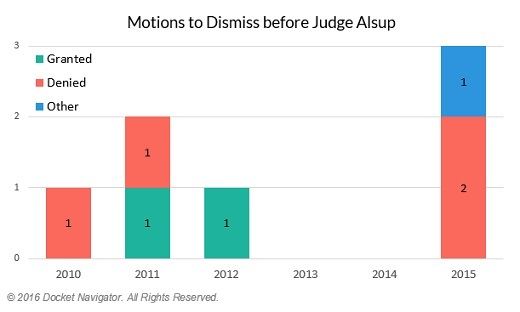 On the other hand, Judge Alsup granted a 2014 motion to stay or transfer a case in light of actions pending in related cases in the Eastern District of Texas (E.D. Tex.). Overall, in six motions to transfer, Judge Alsup has denied two motions, granted one, granted another in part and two others either had their ruling deferred or additional briefing was requested. Motions to dismiss due to a lack of personal jurisdiction are a much tougher sell to Judge Alsup. Since 2010, he has denied four such motions while only granting two; another motion to dismiss had its ruling deferred. In 2015, a motion to dismiss filed by an individual defendant who alleged he never personally managed any of the activities related to the infringement within the jurisdiction of N.D. Cal. was denied because Alsup decided that the defendant was subject to a forum-selection clause of a sales-agency agreement. On the other hand, Judge Alsup granted a 2012 motion to dismiss for lack of personal jurisdiction after a related case being argued in D. Del. reached the same conclusion. Data analytics can be crucial to legal teams, especially those trying to get positive results for their younger, inexperienced associates. Docket Navigator provides tools which help legal teams prepare for a wide range of legal motions. The court granted plaintiff's motion in limine to preclude defendant from making derogatory statements about the PTO as unduly prejudicial and denied defendant's reciprocal motion to preclude plaintiff from making laudatory comments about the PTO. "[Defendant] may not disparage the PTO and its examiners, such as by arguing that examiners are overworked or that the PTO is prone to error. However, [defendant] may offer evidence and argument that specific mistakes were made in connection with the prosecution of the asserted patents. [Defendant's] request that the Court reciprocally preclude 'irrelevant laudatory remarks by [plaintiff] about the USPTO' is denied. The law provides that 'a patent shall be presumed valid' and 'the PTO is presumed to have done its job correctly.' [Plaintiff] is not precluded from praising or lauding the PTO in a manner consistent with the presumption of validity." Following a bench trial, the court found that plaintiffs' fibromyalgia drug patents were not invalid as anticipated or obvious in light of prior art patents and publications. "[T]he record demonstrates that in 2001 and continuing through today, fibromyalgia is a complex disease treated by various medications with different mechanisms of action. At this time, there appears to be no concrete understanding of the cause(s) of fibromyalgia, let alone a clear course of treatment. At best, the teaching of the art was and is multidirectional, with no clear motivation to pursue [plaintiffs' drug compound] as an effective treatment for fibromyalgia. Notably, there were no FDA-approved treatments for fibromyalgia at the time of the patents-in-suit. Consequently, the inventors' development of treating fibromyalgia with [plaintiffs' drug compound] was the antithesis of anticipation and obviousness. . . ."
The court granted plaintiff's motion for judgment as a matter of law that defendants willfully infringed its transformer patent based on the jury's finding of willful infringement. "[T]he jury returned a verdict in favor of the Plaintiff, finding that [defendants] both acted willfully . . . . The Court deferred entering a judgment on the jury’s verdict, however, in order to consider the objective prong of the [In re Seagate Tech., LLC, 497 F.3d 1370 (Fed. Cir. 2007)] willfulness analysis. . . . [I]n [Halo Electronics, Inc. v. Pulse Electronics, Inc., 136 S. Ct. 1923 (2016)], the Supreme Court has overruled the objective prong of Seagate, leaving the issue of willfulness as solely a factual issue which can readily be addressed by a jury. Here, the jury was instructed to make a factual determination as to whether [defendants] acted willfully, and the jury answered this question in the affirmative. In light of Halo, this finding standing alone is sufficient to support a finding of willfulness. Because this Court is no longer required to make a finding to satisfy the 'objective recklessness' prong of Seagate, a judgment will therefore be entered based on the jury’s verdict that [defendants] willfully infringed the [patent-in-suit]." In a final written decision finding claims of a patent directed to methods of distributing a pharmaceutical product unpatentable under 35 U.S.C. § 103(a), the Board determined that portions of the challenged claims were printed matter and therefore not entitled to patentable weight. "[W]e view the information described in [portions of the challenged claims] as printed matter, and, thus, not entitled to patentable weight. In the present case, a cylinder containing compressed nitric oxide gas can be obtained and supplied to a medical provider with, or without, the information recited in [the prescribing information supplied to the medical provider]. Because the 'method of providing pharmaceutically acceptable nitric oxide gas' can be performed irrespective of whether that knowledge is conveyed, we conclude that the step of 'providing . . . information' lacks a functional relationship to the remaining claim elements, and, therefore, accord it no patentable weight." The court granted defendant's motion to dismiss because the asserted claims of plaintiffs’ user authentication patent encompassed unpatentable subject matter and found that the claims were directed toward an abstract idea. "[D]espite the electronic setting and purportedly Internet specific problem addressed, the patent claims are directed to a common method for solving an old problem. The claims are directed to the abstract idea of using a third party and a random, time-sensitive code to confirm the identity of a participant to a transaction. . . . Certainly it is true that the problem of authenticating parties to a transaction has been magnified by computer and network technology. Through computer networks many individuals may conduct business over long distances in an instance. However, just because a problem has been magnified by computer and network technology does not make the problem unique to this environment. . . . It is true, as Plaintiffs argue, that there are advantages to performing the claimed method on computers. However, these advantages do not transform the method into one directed to an improvement of computer technology." The court denied defendant's motion to dismiss on the ground that plaintiffs’ audio compression patents encompassed unpatentable subject matter and rejected defendant's argument that the claims were directed toward an abstract idea. "[T]he invention's ability to run on a general-purpose computer does not doom the claims. Indeed, the claims at issue here undoubtedly make computers more efficient. They solve a problem that the MPEG Audio standards-setting organization identified. They use 'a particular frame format or intensity stereo coding to make the audio processing of [defendant's] computers far more efficient.'. . . Unlike the claims in [another case], which dealt with a way to organize images - something humans can accomplish without a computer - the claims here 'encode[ ] and decode[ ] a wide-band signal in a manner that takes into account the hearing capabilities of the human ear at different frequencies: by coding the most important frequencies as accurately as possible, and coding less critical frequencies less precisely, a realistic replica of the original signal can be reproduced with the minimal amount of data.'. . . Plaintiffs are not seeking to patent a mathematical formula or the general idea of receiving and outputting information. Thus, the Asserted Patents do not claim an abstract idea." The court granted defendant's motion to dismiss because the asserted claims of plaintiff’s patents for finding parking spaces encompassed unpatentable subject matter and found that the claims lacked an inventive concept. "[T]he patents describe a system that uses parking space detectors . . . to send signals over the Internet that are received by a portable device . . . that indicates to the driver whether there are any open parking spaces in the lot, or not. . . . The essence of [plaintiff's] argument is that when these inventions were patented, mobile technology was in its infancy and because these patents were limited to that emerging field, they are patentable. . . . The seemingly ubiquitous problem of finding open parking spaces during the busy morning rush necessarily exists outside of the Internet, and outside computers altogether for that matter. Transmitting that data over the Internet to mobile devices might be useful, but it does not 'override the routine and conventional sequence of events' pertaining to finding a parking space. . . . With these patents, the driver merely looks to her mobile device rather than through her windshield. . . . At bottom, the [patents] describe the shuffling of one type of data over the Internet and with generic computer technology. Those basic computer functions are not directed to a computer-centric problem and thus are not patent-eligible under [Alice Corp. Pty. Ltd. v. CLS Bank Int’l et al., 134 S. Ct. 2347 (2014)] and § 101." The court granted plaintiff's motion to vacate the MDL judge's summary judgment order of no willful infringement following the Supreme Court's recent decision in Halo Elecs., Inc. v. Pulse Elecs., Inc., No. 14-1513 (U.S. June 13, 2016). "The [MDL judge's] order relied exclusively on [In re Seagate Tech., LLC, 497 F.3d 1360 (Fed. Cir. 2007)] in granting summary judgment of no willful infringement. Specifically, in granting summary judgment, the MDL judge found 'Plaintiff cannot satisfy its burden of establishing by clear and convincing evidence that Defendants’ actions were objectively reckless.' The Supreme Court expressly rejected this legal standard in Halo. . . . As such, prospectively applying the [MDL judge's] order would not be consistent with the current state of the law on enhanced damages. . . . In addition, the question of subjective willfulness under the current state of the law is typically a determination reserved for the jury. . . . Here, the pre-trial record reveals factual disputes such that the question of subjective willfulness must be decided by the jury."